Chris starts off on his run Sunday morning at 8:00am. The air at the Boulder Res is 47° with 7mph winds from the northeast so he wears a sweatshirt. The 2013 Boulder Marathon was scheduled to run from here two weeks ago, but became another victim of the Great September Flood. Chris refuses to be a victim. 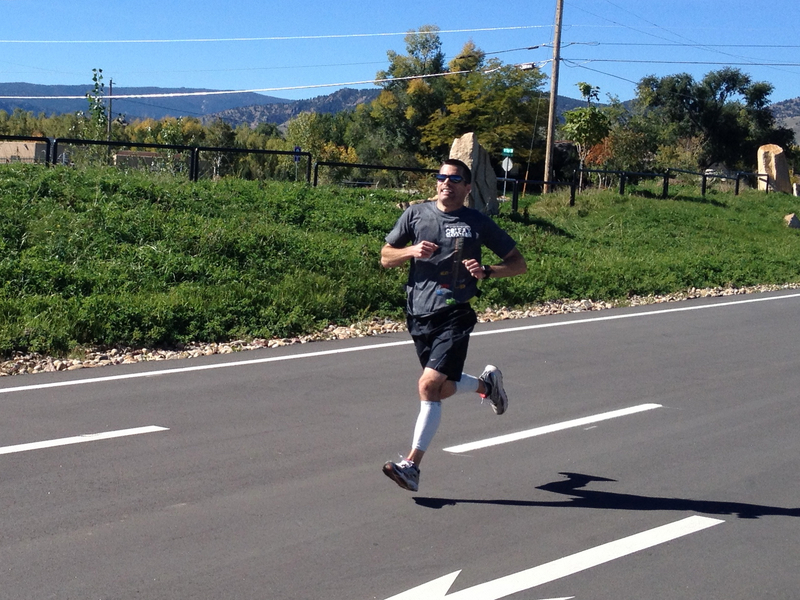 Today he’s running the inaugural 2013 Chris Price Didn’t Do All This Freakin’ Training For Nothing Marathon. There are no waves or corrals at the starting line. Chris is running this one solo. I have other commitments at 8 but catch up to Chris here on Hwy 36 and Left Hand Road. Well into the second half of his run, Chris still looks fresh. He shouts out that he’s four minutes under his target time. 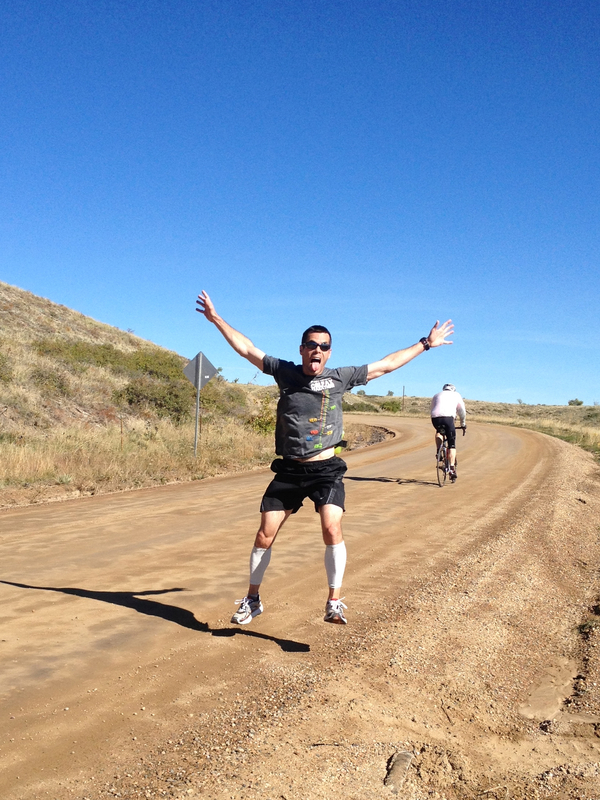 If there’s any doubt about how strong Chris is running, he jumps up like a rock star for this photo on Neva Road – twenty miles into the marathon. Typical antics at big events. Chris doesn’t need a crowd though. He makes his own party. The sun has warmed up significantly by this time, but the air still has some coolness in it. Chris dropped his sweatshirt somewhere in the first half. 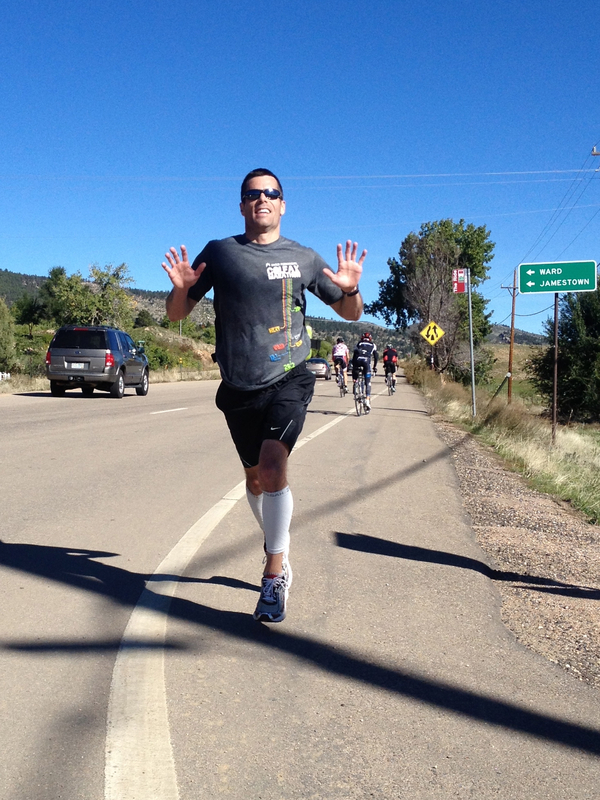 The Boulder back roads are so full of bikers and other runners, it almost feels like Chris is part of an official race. I take note of a couple trailheads off Neva Road I might check out for future trail runs. 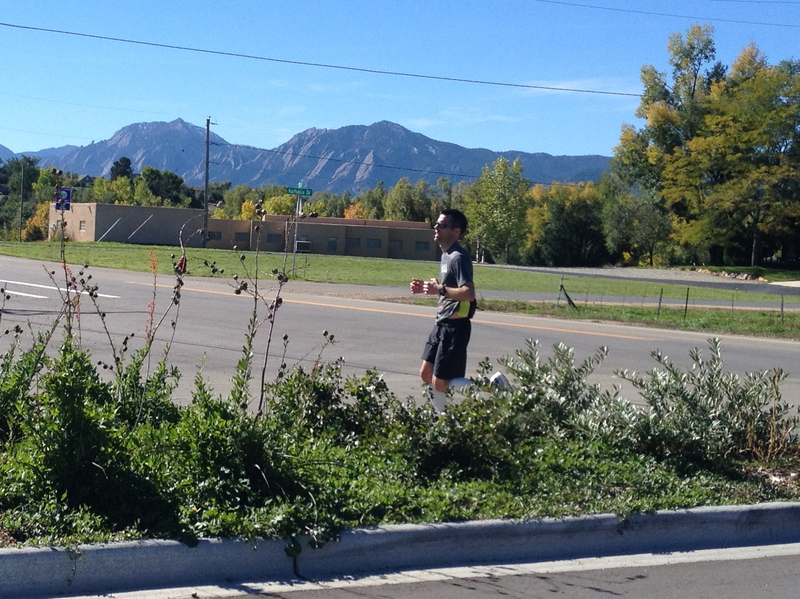 From a photography perspective, I dare say Chris is fortunate the Boulder Marathon was cancelled. The trees are showing their colors much more this weekend than two weeks prior. I can’t recall the weather two weekends ago but today is just incredibly perfect to run. Chris lets me know here at 22 miles that he’s starting to feel fatigue. I think to myself that I hope so. If you’re not feeling tired after running 22 miles, something is wrong with you. I say this about someone running a solo marathon. With two miles remaining, on 55th Street, Chris is still flying with both feet airborne. I’ve run 7 marathons myself. Two as a kid so maybe I shouldn’t count those, but five in the last 3 years. 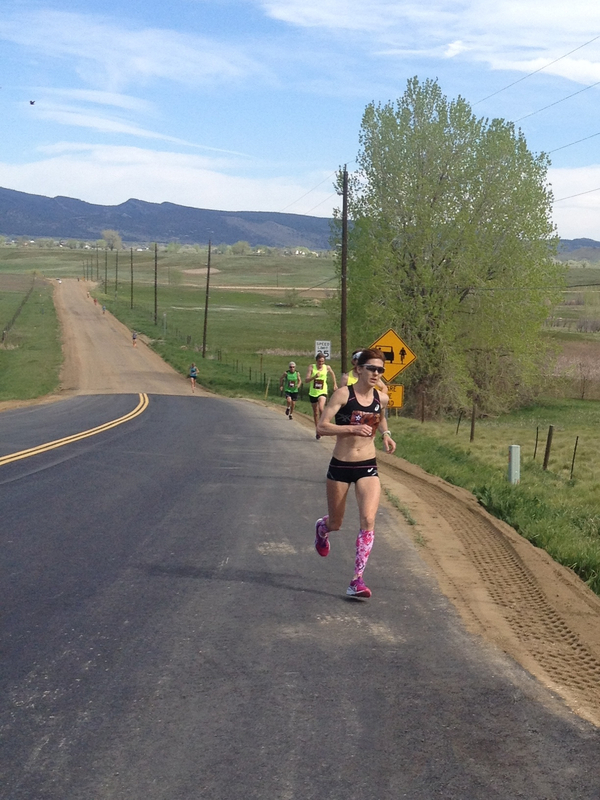 I had a little gas left in my tank in one of the Denver Marathons. And I wasn’t tired at all when I finished the Dallas White Rock Marathon at 18 years of age. Otherwise I’ve always been literally crawling at this point. That’s with crowds cheering me to finish strong. Talk about self motivation. Chris really is a one man race. 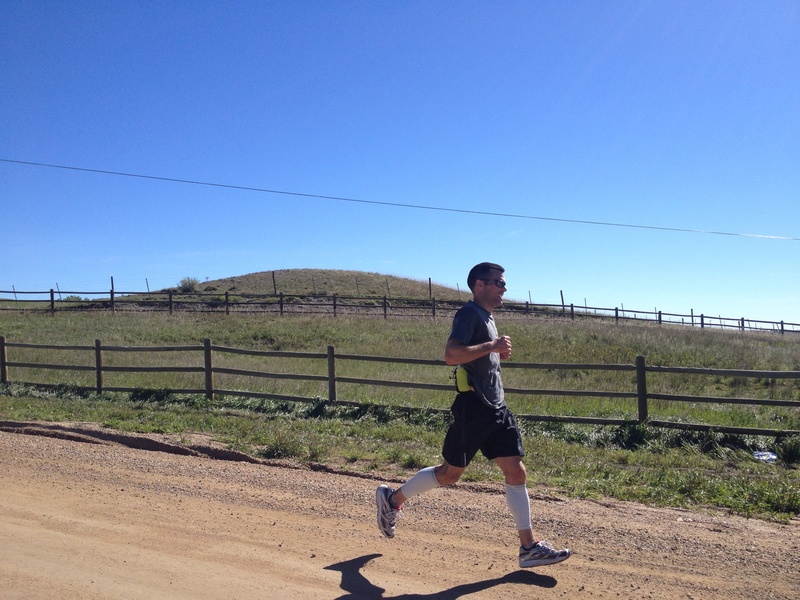 The finish at the Boulder Res presents a quarter mile long hill, but Chris doesn’t seem to notice. I wouldn’t be surprised if he ran a negative split. His family is waiting for him. His daughter runs the final 100 meters with him, but falls behind as he turns on his kick. I wish I’d have been clever enough to string up a finish line tape for Chris to break, but I didn’t know exactly where he planned to stop running. This last photo is of his final strides. His finishing speed and strength are apparent. His time was a few minutes over 3:20. 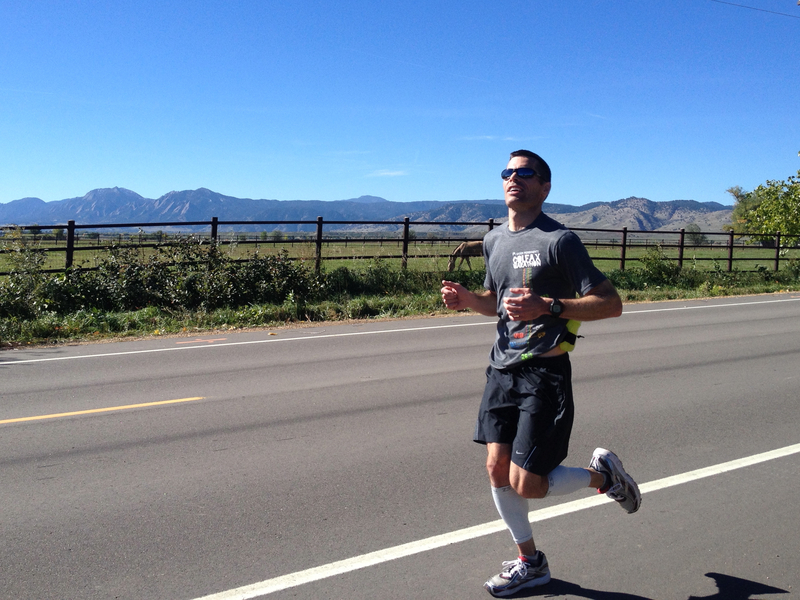 Good enough for 3rd place in his age division in the 2012 Boulder Marathon. Can you imagine running a marathon all by yourself? Steve Jobs said we all die alone. I’d like to know what thoughts went through Chris’ head to power him through this endeavor. I don’t think he played music. I’m simply amazed. Nicely done Chris. Thanks Ed. And thanks again for coming out, and giving me several boosts when I needed them. I just checked, and I did run a negative split, but not my much, and only because I warm up at a slower pace for the first 2m, and then took a longer break at 13m to refill water and shed clothes. As for what I use for motivation, it was mostly “the sooner I get there, the sooner I get to stop”. Weather couldn’t have been better, and the views were awesome! Good job Chris. You make us Price people proud. Wow. Simply wow. Proud of you brother!